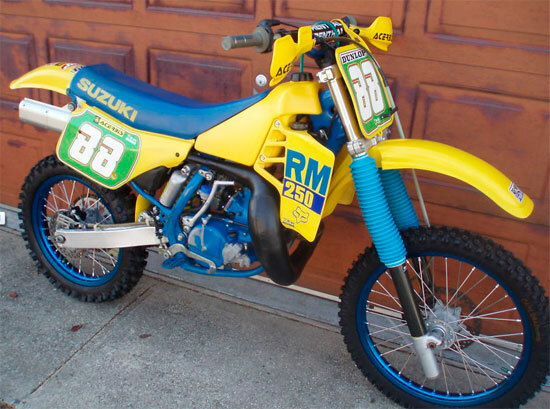 Up for auction is a Real Sweet 1988 RM 250 This machine was a very low hour machine that sat for many years when I bought it. Then I completely rebuilt from top to bottom. Chassis – – Wheels were Relaced with S.S. spokes and new blue anodized rims & Fresh tires New bearing front and back – fork seals replaced – new plastic – Fenders side panels and rad , Shrouds , Gas tank is near perfect! Chain & Sprockets are new Also Pegs are widened.